They say smoking is addictive and I can fully attest to that. I was hooked from the very first time I fired up my Weber smoker. So far I've just been hot smoking, but I'm channeling my inner MacGyver to come up with a cold-smoking system. I think it might involve my smoker and my regular kettle grill, an accordion-type dryer duct and ice. We'll see. Sometimes my ideas work better in my head than in real life. My latest smoking project was sea scallops. They are so easy, I've smoked them twice in the last month. Just brine them for an hour or two and smoke for about 25 to 30 minutes. That's it. I like to leave them in the fridge to dry out after the brining step, but you could essentially skip this and they will still be fine. Just pat them dry before putting them into the smoker. The recipe I used came from Coastal Living (via MyRecipes), but the permalink doesn't seem to work. (So much for being lazy and just linking.) The original recipe calls for 36 sea scallops, which is overkill for a family of three. I usually only buy about 2 to 3 medium-large scallops for each person, so the amounts listed below are 1/6 the original. Scale up accordingly for your needs. Also, the first time I did this preparation, I felt the brine could have been a little more concentrated, so I increased the salt and sugar a little. In fact, I think they could tolerate still more. The alternative is to brine the scallops a little longer, say for two hours. Dissolve the salt and sugar in the water. I do this using my microwave. Cool completely before brining the scallops. 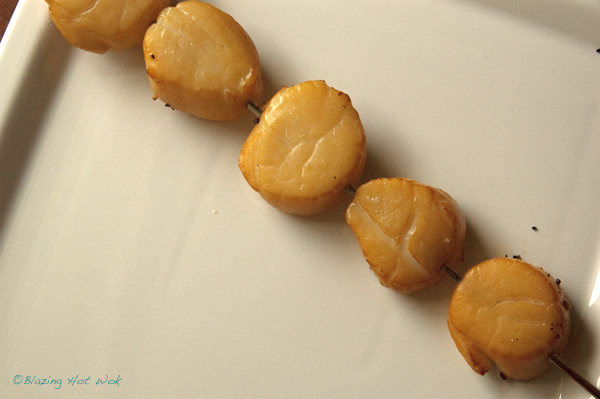 The scallops should brine for at least 1 hour or up to 2 hrs in the refrigerator. Remove them from the brine and quickly rinse with cold water. Pat dry and set on a rack over a plate or sheet pan. Ideally they should sit uncovered in the fridge for a few hours or overnight to dry and form a sticky surface. Hot smoke at 200F (225F max!) for about 25 minutes or until they are just cooked through. I recommend hitting it with more smoke than you normally would right from the start since the smoking time is short. You can probably think of tons of ways to use smoked scallops. Served with a fancy salad of baby lettuce? In sushi? Pasta with a splash of cream? I decided to use them in risotto along with smoked salmon. Good call, if I do say so myself. In a large sauté pan, heat a little olive oil (1 to 2 tbs) over medium heat. Add the shallots and sauté for about 2 minutes. Add the garlic and continue cooking for about 30 seconds. Add the stock and lemon juice. Bring to a boil. 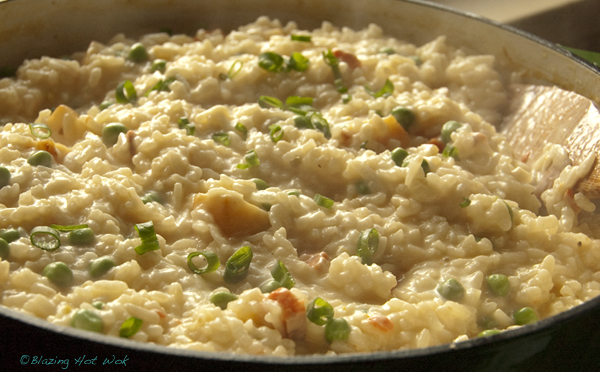 Add the rice, turn down the heat to simmer and continue to cook, stirring constantly. After about 10 minutes, add the peas. When the risotto is just about done, add the fish, cream (if using), Parmesan cheese and butter. Season to taste with salt and pepper. When it's warmed through, it's done! Garnish with the chopped chives and serve immediately. If you have leftover risotto, you can also try making these wonderful crispy risotto cakes. Or how about these fried rice balls?